Just as music sets the mood for a movie, the proper background voice can make the difference in how well the audience accepts a television program or commercial. With broadcast experience going back to 1972, Tim Winker is a popular choice with Duluth area recording studios to provide the voice that sells their message. "I've worked with Tim Winker on many radio projects in connection with my program, 'For the Birds' since 1987. Whether it's five a.m. or late at night, he always sounds warm, intelligent, enthusiastic, whimsical and fun. And the best thing about working with him is that his voice is far more than larynx and mouth. 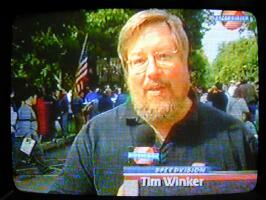 That warmth, intelligence, enthusiasm, whimsy and fun are Tim through and through." Parthé Film & Video Production and Carlson Media in Duluth have hired Tim for several projects due to his outstanding voice and professionalism. During 2001, Tim Winker was heard nationally as the Voice of SCCA ProRally, providing the voice-over narration for the half-hour programs on Speedvision. There were ten half-hour programs, one for each ProRally in the series, plus one hour mid-season and post-season wrapups. Duluth News-Tribune story "Winker: The voice of rally racing"
Narration of the WDSE-TV (Duluth-Superior Public Television) produced television documentary, "Working on the Railroad"
Story in Duluth's Budgeteer News about "Working on the Railroad." Award Announcements for the Lake Superior Ad Club's Addy Awards. Tim Winker was seen -- but not heard -- in a commercial for Daugherty Hardware. He portrayed a customer seeking a hammer. The 30-second spot was produced by H. T. Klatzky & Associates. Tim Winker's voice has also been heard on WDSE-TV (Duluth/Superior Public Television, channel 8) on many underwriting credits.